‘A CONTESTED Land’ examines the complex relationship between Scotland’s people, history and landscape through the work of four photographers. The contrasting series of works by the collective known as Document Scotland, will be exhibited from Tuesday 23rd April, 2019 at Perth Muse-um and Art Gallery, its first Scottish showing. The exhibition was premiered at the Martin Parr Foundation in Bristol early this year and will subsequently move on to Dunoon Burgh Hall followed by photography festivals in Inverness (FLOW Photofest) and Harrogate (PhotoNorth). The exhibition features new and previously unpublished work by each of the collective’s four members. Document Scotland was founded in 2012 by four photographers – Colin McPherson, Jeremy Sutton-Hibbert, Sophie Gerrard and Stephen McLaren. 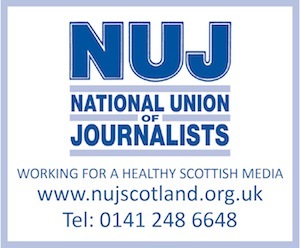 Tired of the tropes and clichés which are often used to represent Scotland, their aim is to provide an accurate view of their nation today and disseminate their work beyond the borders. Although their work is contemporary, it acknowledges the past and its resonance with the present. Jeremy Sutton-Hibbert’s work captures the raw and powerful political theatre of Scotland’s parades and marches. 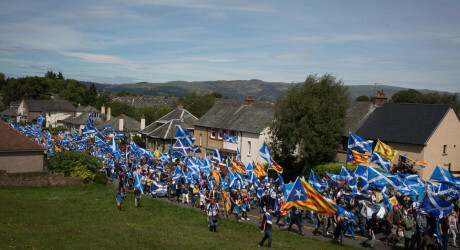 Played out in public spaces from Glasgow to Faslane, depicting pro-Scottish Independence marches to demonstrations against Trident missiles – the photographs collectively show vibrant and lively displays of stand-bearing, placards, slogans and passion. Strip away the banners and confiscate the flags, the adversaries cannot be told apart – they are all Scots. Sutton-Hibbert’s photographs offers a beguiling view of the possibility of an undivided future aside from political discourse and disagreements. The gentle and undulating landscapes of Scotland’s peat bogs are the subject of Sophie Gerrard’s work. Eschewing sentimentality, the photographs look at how this precious environmental resource has been desecrated and denuded over generations and how these almost magical places are being revived and reinvigorated through careful and considered conservation. Once seen as ‘fair game’ for industrial-scale exploitation, this series questions the viewer’s relationship with local and national areas of outstanding beauty, and how such places fit into Scotland’s topography and consciousness, linking people to the land and the land to the people. Stephen McLaren’s series examines the hidden link between Edinburgh’s wealth and the slave trade with Jamaica. Depicting everyday sites across the city once connected to the slave trade, McLaren’s work ignites a conversation about acknowledging an historical wrong, and re-evaluating the relationships with people and communities within and beyond its own borders. History is also the starting point for Colin McPherson’s visual exploration of life on Easdale, the smallest permanently-inhabited Hebridean Island. Once the epicentre of Scotland’s slate quarrying industry, the island has become a by-word for repopulation and reinvention as its current community continues to battle traditional adversaries: economics and environment. At its height in the 19th century, Easdale housed four hundred people – the slates they produced roofed the world. When an epic storm decimated the island in the 1880s it went into decline, only for a new band of pioneers to resettle and revive Easdale nearly a century later. McPherson’s personal connections with the island date back 30 years, and through this series he offers a contemporary commentary on the parallels with the past and how many of the 65 current residents live. ‘A Contested Land’ will tour to Perth Museum and Art Gallery (23rd April – 23rd June), Dunoon Burgh Hall (20th July – 18th August) , Inverness FLOW PhotoFest (September) and PhotoNorth Festival (30th November – 2nd December). Culture Perth and Kinross is a charitable Trust which has responsibility for the delivery and development of archive, library, museum and gallery services in Perth & Kinross. Opening hours Tuesday – Sunday 10:00 – 17:00. Admission is free. Born in Edinburgh, Colin McPherson has been photographing in Scotland and abroad for more than 25 years and is represented by Getty Images. McPherson’s work is published internationally and held in archives and collections such as the Scottish National Photographic Archive and the University of St. Andrews University Special Collections. His photography has been featured in more than 30 solo and group exhibitions. His major Document Scotland projects include ‘A Fine Line’, ‘The Fall and Rise of Ravenscraig’ and ‘When Saturday Comes’, which was exhibited at the Scottish National Portrait Gallery in The Ties That Bind. Jeremy Sutton-Hibbert grew up in Scotland and is a freelance photographer for editorial, corporate and NGO clients. His work has appeared in magazines such as Time, National Geographic, Italian Geo, Le Figaro, The Guardian and The Sunday Times amongst others. For over a decade, Sutton- Hibbert has been one of the principal photographers for Greenpeace International, and his assignment work for editorial and corporate clients has taken him to over 100 countries. His personal and commissioned work, for which he has been the recipient of photojournalism awards, has been widely published and exhibited in Europe, Asia and USA. Stephen McLaren was a television director and journalist making documentaries for the BBC before returning to photography in 2005 His work has been shown in several exhibitions including: ‘Onto the Streets’ at Photofusion in London, ‘Eastend Street: Then and Now’ at the Rich Mix Centre in London, FORMAT in Derby and Look11 in Liverpool. His work has been published in The Guardian, The New Yorker and The Observer amongst others. He has curated street photography exhibitions which have travelled round Europe with the British Council and he is the co-editor of Street Photography Now (Thames & Hudson, 2010). MEDIA RELEASE issued by Colin McPherson. You too can share your stories (aka press or media releases), on this site. Email here for more information. Check out too twitter.com/allMediaNews and twitter.com/allPerthPR.